Funny Christmas Wishes : Hey, it’s Christmas Eve and everybody is looking for some unique way to share the fun with each other. From your search, we came to know that you also need some funny Christmas messages to make fun on this Christmas Eve. 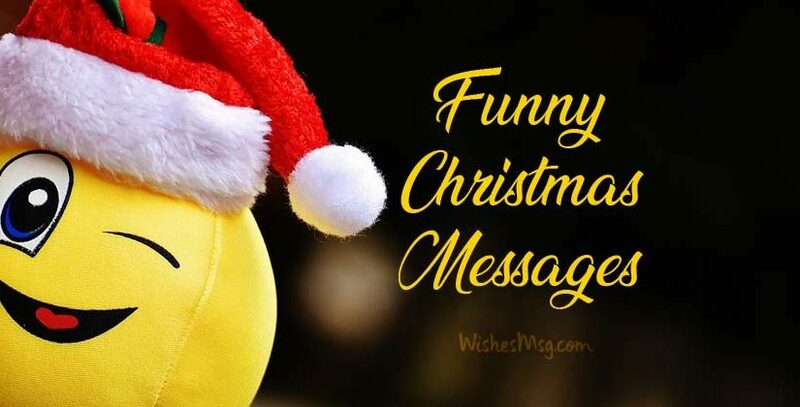 Take a look at the best ever compilation of funny Christmas messages to make some great moments of laugh out louder with friends, family and dear ones! Surely these funny Christmas wishes are little naughty and a great source of fun. So, don’t be late to get the funniest messages to share with your desired person and make them LOL. 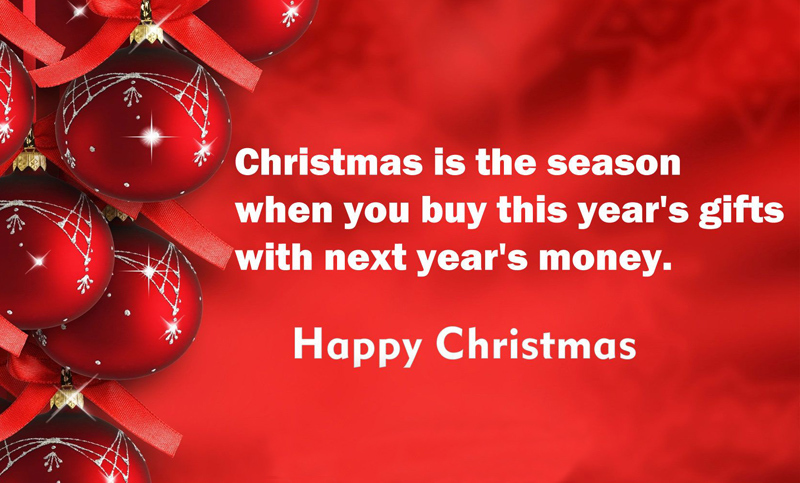 I hope your smiles will just be as big as your credit card bill in this Christmas! Wish you good luck and a lot of fun. Happy Christmas! I hope Santa fills our socks with cash money instead of gifts and toys. I know you hope for the same. Wish you a happy Christmas! This Christmas is all about feeling special. I hope you spend this Christmas drinking to the point that you completely forget you’re a loser! Merry Christmas to you. I can see you have a great decoration there. But I think your credit card bill will not be as attractive as your decorations! One important rule of Christmas; You can eat all the sweet candies as long as you don’t forget to brush your teeth. Merry Christmas! May you survive the boring speech of priest in the church and join me at the party as soon as possible. Merry Christmas! Christmas is season of magic and mystery. All your savings for the year will have vanished and you won’t even know it. How awesome! The reason why everyone makes wishes in every Christmas is that no one’s wish ever comes true! Making Christmas wishes is just a custom! Merry Christmas! You are too young to go to a club and have a drink and too old to expect gifts from Santa. In fact, you just don’t fit into the joys of Christmas! I don’t know if you realize it or not, but you are getting fatter than Santa Clause. Even Santa would bully you this for being so fat! Merry Christmas! Christmas is not only for praying and praising But for drinking and messing around also, Merry Christmas! Dearest God, this Christmas I planned on going green. So please get the point and send me lots of cash this Christmas. Thank you! Christmas is truly full of wonders. It makes all of my savings disappear! That is the Christmas magic, Merry Christmas! Santa was looking at a painting for a long time of a naked woman with leaves covering the body, Santa asked what are you doing and she answered: Waiting for autumn. 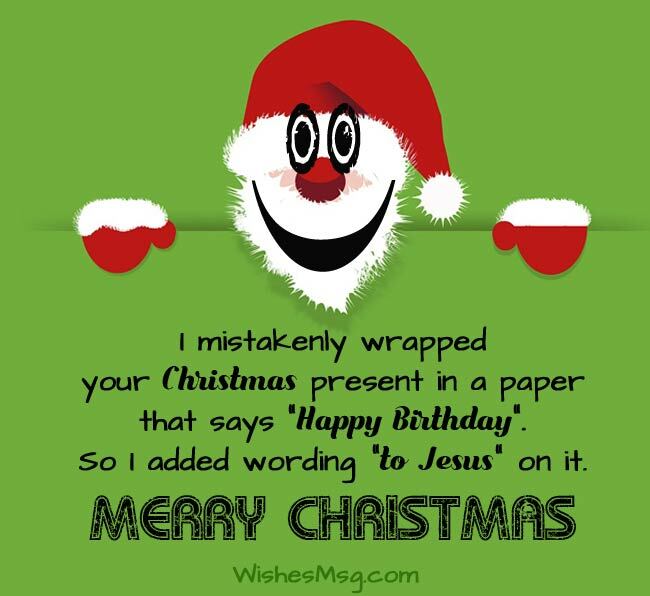 I mistakenly wrapped your Christmas present in a paper that says “Happy Birthday”. So I added wording “to Jesus” on it. Merry Christmas! Christmas is mostly for children. But we adults can enjoy it too until the credit card bills arrive! A peach is a peach, a plum is a plum, a kiss is not a kiss unless it’s with tongues. So open your mouth and close your eyes and give your tongue some exercise! Merry Christmas! I’ve finally found the true meaning of Xmas, it’s for those people who can’t spell Christmas! 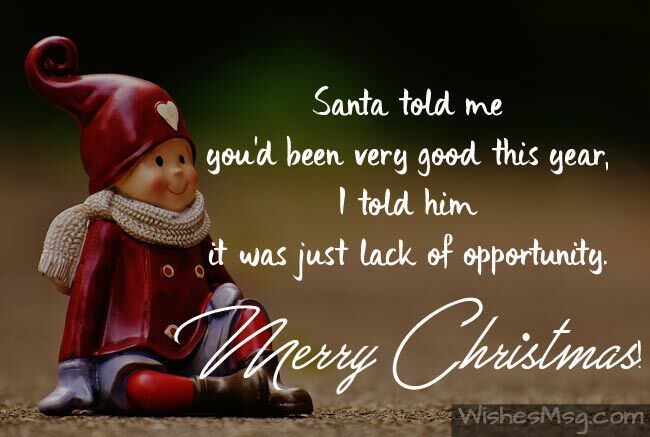 Santa told me you’d been very good this year, I told him it was just lack of opportunity. Merry Christmas! Please allow Jesus to Come and Bless people in Church on Christmas, If he sees you there he may not. So come here and have a party with me, Merry Christmas to you! There are four stages in life: 1) You believe in Santa Claus. 2) You don’t believe in Santa Claus. 3) You are Santa Claus. 4) You look like Santa Claus. I think Santa should hire giants instead of elves so that he can have a faster production of gifts. Have a fun Christmas! A Christmas Reminder: Don’t try to borrow any money from elves; They’re always a little short! Have a Merry Christmas! Dear Santa, If you promise to be nice and give me everything on my list, I promise to give you the antidote to those poison cookies you just ate. Thank you. Christmas is the festival of love and spirit So let us drink the spirit to feel love, Merry Christmas too! Hey you two over there, It’s the old, bearded guy and his silly reindeer! We’re here to bring you holiday cheer and wishes for a Merry Christmas and a Happy New Year! Santa left batteries under the tree with a note that said “Due to cutbacks, toys not included. Christmas is a time for remembering family and trying to guess everyone’s sizes! Have a Wonderful Christmas! I have Kept some photos in my home So come here instead of Church you can drink and pray, And no more boring speech from the priest Merry Christmas and Happy New year! Dear visitors, it’s our great pleasure to share with you the best compilation of funny Christmas messages and we will be more pleased if these messages could make your task successful, thank you and Merry Christmas!